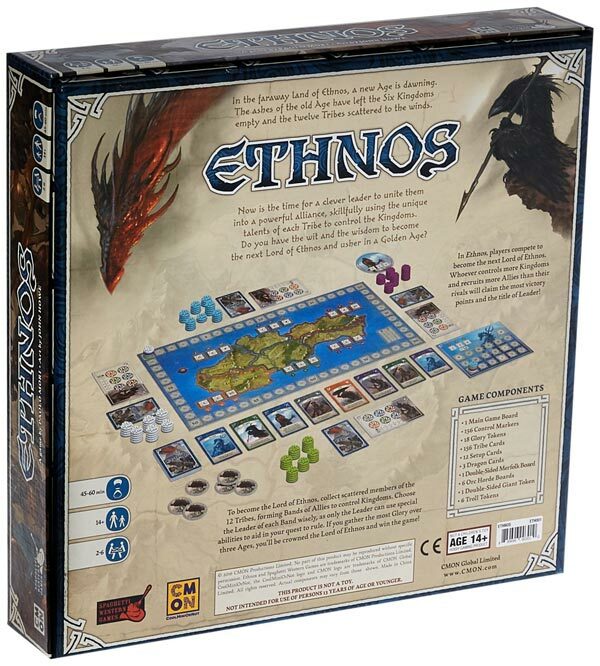 Ethnos is a fun board game that combines some elements of other great board games. It has the card drafting simplicity of Ticket to Ride. It has a bit of Area Control like Small World. The game even has a Rummy 500 feel to it with colors and suits. This is a very easy game to teach new players, and it offers a lot of replayability. In Ethnos, you recruit different Tribe cards into your hand (by drafting). You form your cards into Bands. And then you play those bands of alliest to assert your control in one of the six Kingdoms. Over the course of 3 Ages, you battle against your opponents in a war for dominance and glory. Game Play starts off simply. On your turn, you either: Draft one Ally or Play a Band of Allies. That’s it. Simple as that! Each Tribe has at least 12 members – available in Six Different Colors (matching the colors of the countries on the game board). You draft cards until you can, or want, to play a Band of Allies. A Band can be as small as 1 card, or as large as 6+ cards. Your band must consist of cards of all the same tribe, or all the same color. Example: you could play a band of 3 Orcs, or 3 Dwarves, or 3 Green Cards, or 3 Red Cards. You score “Glory” points in a very similar scoring fashion to the board game Ticket to Ride. The larger the band of allies you put in the play, the more glory points you receive. A Band of 2 Allies will only net you 1 Glory Point. But if you wait until you can play a band of 6 Allies, you will score 15 Glory Points. You can also earn Glory via Area Control on the game board. The game board depicts the land of Ethnos divided into 6 different Kingdoms. Each Kingdom is represented by a different color, matching the colors on the Tribe Cards. Whoever controls these kingdoms at the end of each age is awarded bonus glory points. During the game, you will try to use your band of Allies to help you take control of Kingdoms. For example, if you play a band of Red Allies, you might be able to put one of your control markers in the Red Kingdom. If you play a band of dwarves, and you put the purple dwarf on top, you might be able to put a control marker in the purple kingdom. The first time you enter a kingdom on the board, you will only need to play a band size of “1 or more” of that kingdom’s colors. You’ll need 2 more to add another token. You’ll need 3 or more to add a 3rd token to that kingdom. You will be competing with everyone else at the table to have the most tokens (bands) in kingdoms for extra glory. After you play a band of allies, you discard the remaining cards face-up near the draw pile and make those remaining cards available to everyone to draft during their turns. 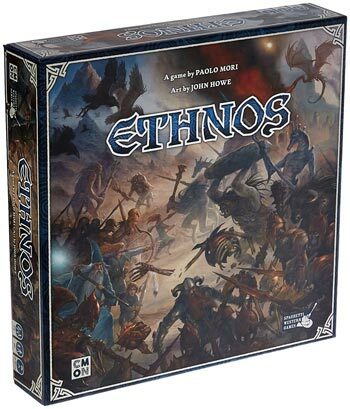 The different tribes in Ethnos each have their own special powers. When you play a band of allies, you will make one character the leader. The band will use the traits of the leader each time you play a band. This also gives the game a little twist similar to Small World. A Minotaur essentially counts as 2 allies when they are the leaders. Elves let you retain cards in your hands when are made leaders. Centaurs allow you to play two tribes at once. 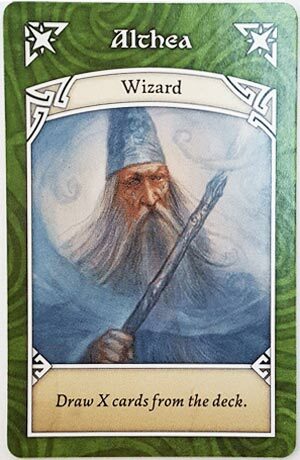 Wizards allow you to fill your hands back up with cards equal to your band size when you make them a leader. 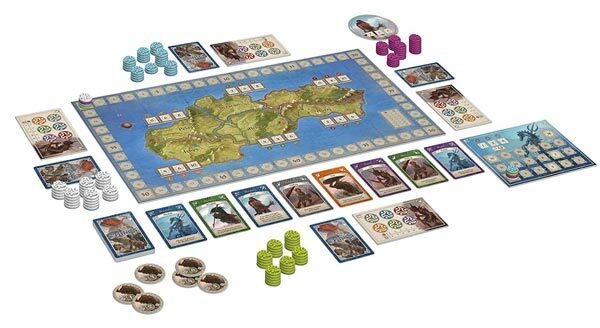 The game is played over the course of 3 rounds – They call them “Ages” in Ethnos. 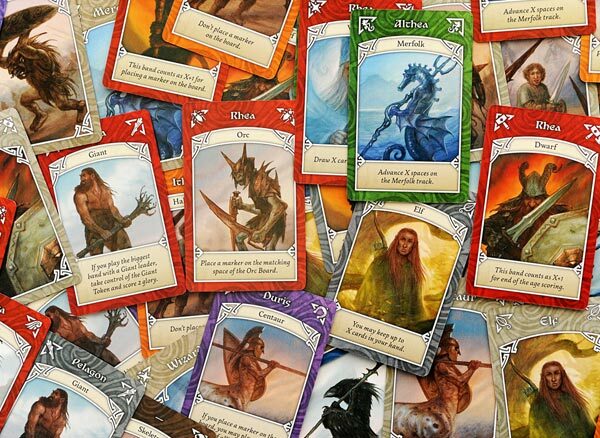 At the beginning of each round/age, 3 Dragon Cards are randomly shuffled into the bottom half of the draw pile deck. When the 3rd Dragon Appears the Age immediately ends. At the end of each age you add up how many points you’ve earned via the Kingdoms you control. You also add in your points of the bands of tribes you’ve played. Whoever has the most points at the end of the 3rd age is the winner. Easy to teach. The game is not difficult to grasp. If folks have played Ticket to Ride, then this might be a nice step-up strategy wise. 2 to 6! Not too many board games go up to 6 players. Many popular games to 4 or 5 players, but not too many of this caliber go to 6. And the game plays pretty with as little as 2 players. .
No player elimination. Everyone plays until the very end. Reasonable Time Duration – The box says 45 to 60 minutes, and I think this is dead-on. As folks get comfortable with the play and scoring, the game moves along at a nice clip. Folks are either drafting a single card or playing a band of allies. It’s back to your turn before you know it! Even with 6 players, you are not sitting around too long between turns. Good Strategy. Even though you are only drafting a single card on your turn, you have to be working on a strategy. What colors are you going to go for? Or what Race should you grab? Who should be your leader? What Kingdom is best to try to control? Lots of replayability – During setup you will randomly pick ½ the tribes to play. And you will randomly assign different scoring values to different kingdoms every game. This makes each game unique. The gameboard and cards’ colors and art are just kind of muted and blah. Art is totally a subjective thing, and I’m certainly not an artist by any means, I just wish everything “popped” a little bit more. The cards, the board and the box all have a dreariness to them that doesn’t match the fun of the game. You could easily see this box in a game store and walk right by this one. But you shouldn’t. The Board size seems a bit small. When you have 6 players playing, the kingdoms seem a bit on the tiny side for holding all the control tokens. This is an easy game to recommend to everyone. The price is fair. It plays in less than an hour. And it’s easy to teach. The strategy is a bit deeper than a Ticket to Ride game. Even though gameplay is relatively simple, each player still faces a variety of strategies and decisions. Turns move quickly. And during gameplay, everyone feels like they can still win until the very game. This is a very fun game that accommodates up to 6 players. I can easily see CMON making expansions for this game down the road, and I’m looking forward to that. Check out our other Board Game Reviews.